As previously covered here, we know that Marvel had a short list of contenders to play the pivotal character. John Krasinski was the early favorite and nearly had the job until a huge fan blowback left Marvel second guessing the original choice. New actors were tested and added, but Marvel now seems confident that Chris Evans is the right guy for the job. 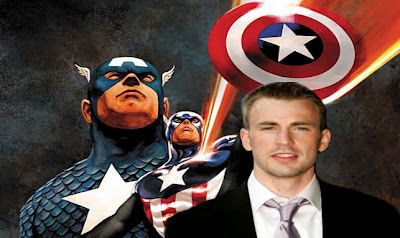 While Marvel has offered the role to Chris Evans, the 28 year old actor has not accepted (as of yet). Why? Well Evans had previously signed on to star alongside Anna Farris in a romantic comedy titled, "What's Your Number?" The rom-com is scheduled to shoot at the very same time as "The First Avenger: Captain America" leaving Evans with a decision to make. Certainly taking on the role of Captain America is a much bigger prospect than just another romantic comedy. So it goes without saying, I'd expect Evans to take on the role. The role would potentially launch Evans into a whole new category from his previous roles. Which have been primarily of the supporting nature. The big question now is, what will fan reaction be? Will Marvel fans embrace an actor that already played another Marvel hero? Surely there will always be naysayers, but there is definitely room for concern. Evans has yet to have a lead role that people got behind. His best work has been in his supporting roles. That said, I'm a believer that he has the potential do a great job in this role. Stay tuned for more updates, including if Chris Evans will accept Marvel's offer.